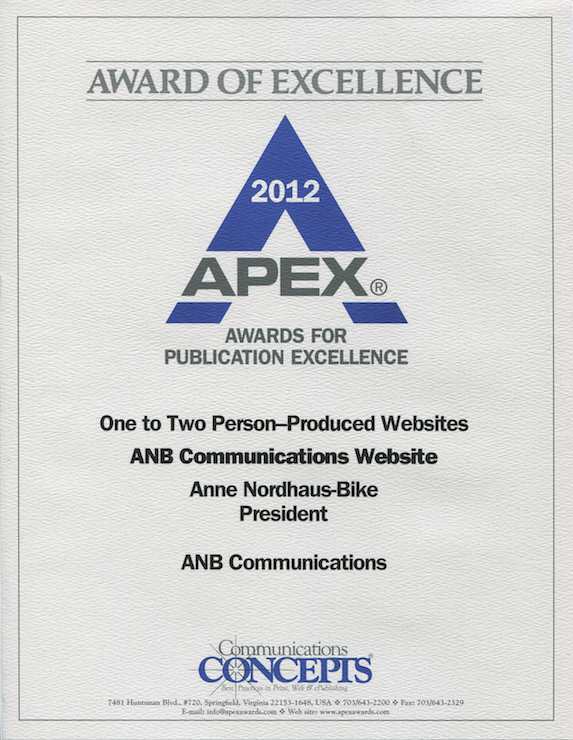 Anne Nordhaus-Bike, president of ANB Communications, has won a 2012 Communications Concepts Apex Award of Excellence in the One to Two Person-Produced Websites category. The award recognizes her work in designing and building her company’s website, www.anbcommunications.com. “Apex Awards are based on excellence in graphic design, editorial content, and the ability to achieve overall communications excellence,” said John De Lellis of Communications Concepts, a journalism and communications think tank based outside Washington, DC. This prestigious international award is the sixth Apex Award and the seventh writing/communication award earned by the firm. See the Apex Award press release for more details. Thanks for stopping by our site and taking a moment to comment. You might want to check out plugins and themes for mobile. (A clean, simple design also helps.) Good luck!